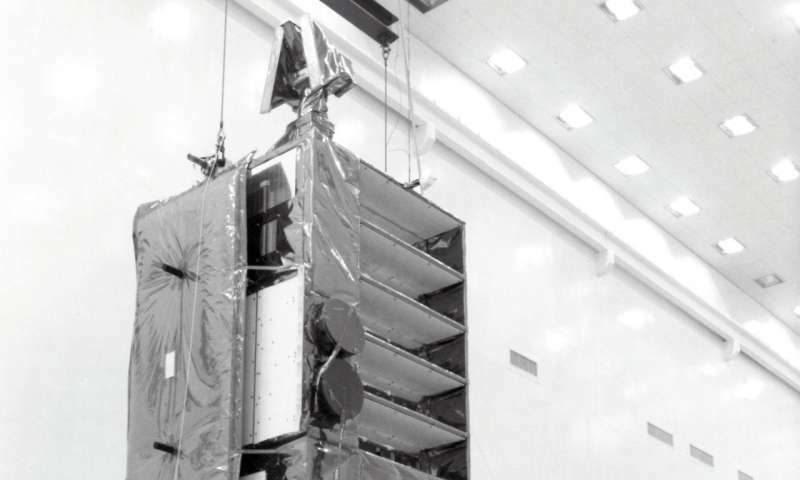 NASA's decommissioned Rossi X-ray Timing Explorer (RXTE) satellite re-entered Earth's atmosphere on April 30. Orbiting for more than 22 years, the 6,700-pound satellite operated from 1996 to 2012, providing scientists with an unprecedented look into the extreme environments around neutron stars—also known as pulsars—and black holes. The strong gravity of these objects can pull streams of gas from a nearby companion star and corral it in a vast storage zone called an accretion disk. The orbiting gas becomes heated by friction and reaches temperatures of millions of degrees—so hot, it emits X-rays. As the gas spirals inward, powerful bursts, flares and rapid pulsations can occur in the innermost accretion disk and on the surfaces of neutron stars. These X-ray signals vary on time scales ranging from a few seconds to less than a millisecond, providing important information on the nature of the compact object. 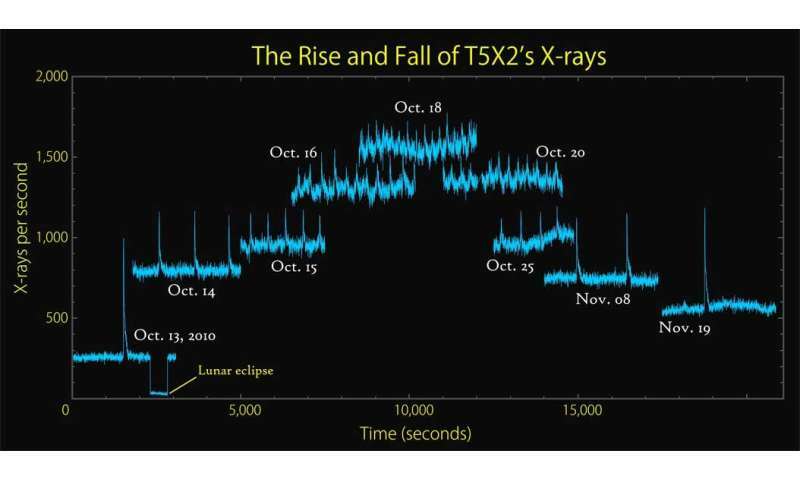 "Observing these X-ray phenomena with precise high-resolution timing was RXTE's specialty," said Jean Swank, an astrophysicist emeritus at NASA's Goddard Space Flight Center in Greenbelt, Maryland, who served as the mission's project scientist until 2010. "During RXTE's run, no other observatory could provide these measurements." RXTE far exceeded its original science goals and leaves behind an important scientific legacy. All data from the mission is open to the public and is maintained by Goddard's High Energy Astrophysics Science Archive Research Center. "The data remain a treasure trove for studying compact objects, whether pulsars and stellar-mass black holes in our own galaxy or supermassive black holes in the cores of distant galaxies," said Goddard's Tod Strohmayer, who served as RXTE's project scientist from 2010 through the end of the mission. "So far, more than 3,100 published papers in refereed journals, totaling over 95,000 citations, include RXTE measurements." Watching how matter behaves in the vicinity of a black hole helps astronomers glimpse details about the nature of gravity itself. In 1997, RXTE provided what is widely regarded as the first observational evidence of "frame dragging," an effect predicted 79 years earlier by Austrian physicists Joseph Lense and Hans Thirring using Einstein's general theory of relativity. In binary systems where black holes strip gas from a normal companion star, fast X-ray oscillations track hot blobs of gas orbiting deep within the accretion disk. These changes indicate that the inner disk wobbles in just the way relativity predicts. Like a bowling bowl spinning in molasses, the rotating black hole drags along nearby space-time—and with it, the inner accretion disk. Only slightly less extreme than a black hole is a neutron star, the crushed core of a massive star that ran out of nuclear fuel, collapsed under its own weight and exploded as a supernova. Each one squeezes more than the Sun's mass into a ball roughly 12 miles (20 kilometers) across—about the length of New York City's Manhattan Island. Neutron stars typically possess magnetic fields up to 10 trillion times stronger than Earth's. RXTE data helped establish the existence of a new class of neutron stars with magnetic fields a thousand times stronger. Dubbed magnetars, these objects boast the most powerful magnetic fields known in the cosmos. Of some 2,600 neutron stars now cataloged, only 29 rank as magnetars. In the absence of RXTE, NASA's Neutron star Interior Composition Explorer (NICER), an instrument installed on the skyward side of the International Space Station, continues the study of variable X-ray sources. "NICER is the successor to RXTE, with an order-of-magnitude improvement in sensitivity, energy resolution and time resolution," said Goddard's Keith Gendreau, the mission's principal investigator. "The X-ray band NICER observes overlaps the lower end of RXTE's range, which means we can more easily take advantage of its long observational record."